Home Food DynamicGreens Flash-Frozen Wheatgrass: Better than Fresh! 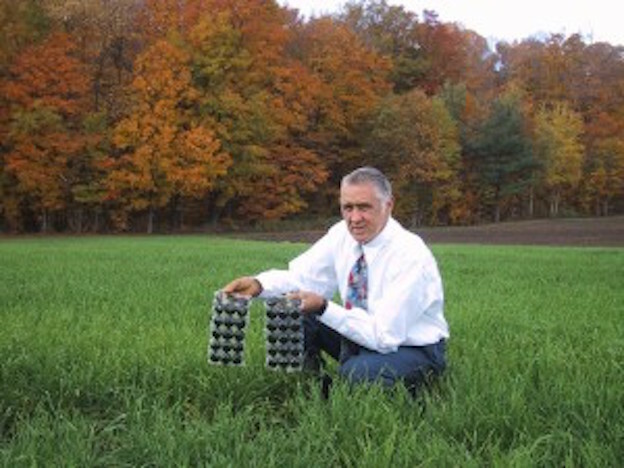 DynamicGreen Wheatgrass is grown right on this organic family farm! Wheatgrass juice is a complete food because it contains well over 100 known vitamins, minerals, amino acids, enzymes, essential fatty acids and anti-oxidants. Wheatgrass is the young grass of the common wheat plant, Triticum aestivum, a subspecies of the family Poaceae. Wheatgrass is usually grown indoors in greenhouses on trays filled with a potting mix. But DynamicGreens Wheatgrass Juice is field-grown in a remote area of Canada, far from pollution and chemical spraying, then “flash-frozen” so that it is even better than fresh! DynamicGreens Wheatgrass Juice is actually grown right on an organic family farm! It’s harvested right at its young, grassy stage at a height of 7 – 11 inches. At this point, it is loaded with living energy and when squeezed, the tender young blades express a rich, dark green liquid called wheatgrass juice. Wheatgrass juice is a complete food or super food because the broad spectrum of nutrition can single-handedly support the body. When consumed in a raw / living state, wheatgrass juice contains well over 100 known vitamins, minerals, amino acids, enzymes, essential fatty acids and anti-oxidants. farming and high tech juicing are a perfect combination. wheatgrass juices rapidly loses nutritional value when refrigerated, pasteurized or irradiated. Molds cause most of the problems people associate with wheatgrass juice, often incorrectly blamed on cleansing or detox! Healthy wheatgrass tastes great and is easy to drink without upsetting the stomach. Flash freezing technology keeps food safe because it stops the biological clock. This preserves nutrition and prevents the growth of microorganisms. Wheatgrass pills are usually freeze-dried. Sometimes the juice is sprayed through a drying chamber with some heat … which quickly oxidizes the juice. It’s still wheatgrass, so very powerful, but it is a bit degraded by that process. Freeze-drying is a little better, but but still not ideal. The best way to enjoy wheatgrass juice is to make it fresh yourself and drink it right away or it will go rancid very quickly. When I do a or 3 week cleanse, I used to grown a few trays of wheatgrass right at home. Then I drink an ounce or two of the fresh juice twice a day. Properly grown, even tray-grown wheatgrass has the power to transform your health! However, the best way to grow wheatgrass, however, is out in a field under the sun and in the fresh air — like on an organic farm with lovingly nurtured organic soil. Field-grown wheatgrass juice is a true superfood because it has much more nutrition and life force than anything else. Tray grown plants are just naturally inferior and prone to molds, making the wheatgrass juice more difficult to tolerate. In fact, for people sensitive to molds it can be impossible to drink at all. 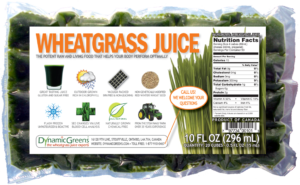 The only organic, field-grown wheatgrass that I know of is DynamicGreens Flash-Frozen Wheatgrass. This is the finest, cleanest, purest source of wheatgrass juice that you can enjoy with confidence. This juice is made fresh than flash-frozen so quickly that all the nutrients are preserved. Its a great way to help the body detox and purify. You can even taste the difference — DynamicGreens wheatgrass juice is more delicious than anything may have tasted from a greenhouse! Grown Outdoors — Solar Energy! No Mold! Completely Organic! Field-grown, flash frozen, organic wheatgrass juice is more potent & healthy than your own home-grown wheatgrass, too. It has to be much hardier to grow in the wild, out in the fresh air and under the sun. Home-grown or greenhouse-grown wheatgrass is actually grown in an “artificial environment,” so it’s weaker and prone to molds. DynamicGreens organic field-growing technique creates the ideal conditions for healthy plants – real sunlight, fresh air, low density planting, miles from any chemical spraying, planned fallowing of the land and much more. DynamicGreens is not available in stores or eve my own website because it is not pasteurized or irradiated. You must buy it only from the DynamicGreens website. This is a family-farm business so supplied, though they grow plenty during a good season, are very limited. But it is truly the best raw, organic wheatgrass juice. you can get. Remove a juice package from the freezer and leave it on the counter for 1 minute before proceeding. Follow the instructions on the back of the label which show you how to break apart the cubes by twisting the package. Cut open the top of the bag with scissors. Add the desired number of cubes (0.5 fl. oz each) to a glass. Add at least 3 x more water than juice (filtered, room temperature water preferred). Stir to thaw and drink it as it thaw (add more water to speed melt). Please avoid using heat, hot water or microwaves to speed the melt. Heating the juice destroys vitamins and enzymes and compromises all its live qualities. Place ingredients in a high-speed blender like a Vitamix or Blendtec and blend until smooth. Drink immediately. You’ll be surprised to know that wheatgrass juice goes back thousands of years years to the ancient Egypt and Mesopotamia. Egyptians prized the leafy blades as sacred afor many for health benefits. In the 1930s wheatgrass became an American superfood when Dr. Charles Schnabel, an agricultural chemist, compared wheatgrass to other nutrient-dense vegetables and found it to be dramatically superior. In the 1940s, the “Father of Wheatgrass,” started to market wheatgrass powder. In the 1950s, “cereal grass” tablets were one of America’s best-selling supplements. Soon, whole-foods advocate Ann Wigmore began to juice wheatgrass for her wheatgrass-based dietary protocol at the Wigmore Hippocrates Health Institute in Boston, the first wheatgrass-based program in the U.S., where she would educate thousands on the benefits of wheatgrass and a live-food, raw diet. DynamicGreens is not available in stores because it is not pasteurized or irradiated so it is truly a raw, organic wheatgrass. However, you can order directly at their website right here! Click Here to Download my RawFoodLife Wheatgrass E-book! Each 100 fl. oz. gives you 200 0.5 fl. oz. servings in convenient fresh frozen cubes. What Mainstream Media Isn’t Telling You About GMO Foods!